I often wonder how music would have sounded today had Gil Evans never existed. We celebrated the centenary of Gil’s birth last year, and this year marks the 25th anniversary of his death, but for those of us who love his work he seems ever present, both in the enduring wonder of his own music and in his subtle but persistent influence on others. A few weeks ago it was announced that Ryan Truesdell’s Centennial, a crowd-funded (via ArtistShare) CD of new recordings of lost or obscure Evans arrangements, had been named record of the year by the US Jazz Journalists’ Association. A New York-based composer, Truesdell secured access to Gil’s archive and delved deep into the arranger’s history for previously unrecorded pieces for Tommy Dorsey (“Dancing on a Great Big Rainbow”) and Claude Thornhill (“Who’ll Buy My Violets?”, “Beg Your Pardon”, “How About You?”), and a version of “Maids of Cadiz” written for Thornhill seven years before it appeared in reworked form on Miles Davis’s Miles Ahead. He does a wonderfully empathetic job of imagining how Gil might have completed work on “Punjab”, a piece which previously only existed in a skeletal rejected version (from the 1964 sessions for the classic The Individualism of Gil Evans). He also earns my gratitude, in particular, for unearthing a couple of important arrangements written by Gil for a concert with a 24-piece Dream Band at the Berlin Jazz Days in 1971. I was present that night, and I retain a vivid memory of how, although the band was full of excellent musicians, the performance was disappointing and suffered badly from a lack of adequate rehearsal time. Particularly in the days before he espoused electric instruments, Gil’s music was all about nuance and heavily dependent on his musicians’ understanding of his unusual modus operandi, including an approach to conducting that was, shall we say, suggestive rather than prescriptive. Thanks to Truesdell’s diligence, here there are no such problems, and we get an extended 12-minute treatment of “The Barbara Song” (the Kurt Weill tune also featured on The Individualism), now with a thoughtful vibes solo from Joe Locke in place of Wayne Shorter’s immortal tenor saxophone improvisation, and a 19-minute medley of “Waltz”, “Variation on the Misery” and “So Long”. The glistening performances are everything Evans might have wished to hear that night in Berlin, and completely true to his spirit. If it is one thing to recreate the music he wrote as accurately and sympathetically as possible, it is another to use it as a platform for further exploration, which is what, in his characteristically quiet way, the composer and arranger Mike Gibbs has done on his latest album: Mike Gibbs + 12 Play Gil Evans, released this month on the Whirlwind label. Unparalleled in his devotion to and understanding of Evans’ music, Gibbs has allowed it to colour and inspire his own work for the past 40-odd years, ever since he came to prominence with such compositions as “Family Joy, Oh Boy” and “Sweet Rain”, made famous by Gary Burton and Stan Getz respectively in the late ’60s. For this new album, recorded in London earlier this year, he takes six of Gil’s arrangements and, rather than using the original charts as Truesdell did, makes his own transcriptions, to which he adds his own variations. I can’t imagine anyone else bringing this off, but from the very start, with “Bilbao Song” (another Weill tune, recorded by Evans on Out of the Cool in 1960), it’s apparent that he is fully capable of adding something new and valuable to what is already a masterpiece. We also get a third great cover version of Gil’s perennially seductive “Las Vegas Tango” (based on Ravel’s “Piece en forme de habanera”), to go with those on Robert Wyatt’s End of an Ear (1970) and Michael Shrieve’s Stiletto (1989), and beautifully enhanced treatments of “Sister Sadie”, “Spring is Here”, “St Louis Blues” and “Wait Till You See Her”. The album is completed by arrangements of four tunes with no Evans connection: Ornette Coleman’s “Ramblin'”, Carla Bley’s typically enigmatic “Ida Lupino” and Gibbs’ own “Feelings & Things” and “Tennis, Anyone?”. It’s the highest of compliments to say that all 10 pieces maintain a unity of tone, texture and vision, with “Ida Lupino” contrasting a clarinet lead and low brass in a way Gil would surely have loved, while demonstrating just how far from pastiche this exercise is. The soloists, too, are up to the task. The bassist Michael Janisch, outstanding throughout in partnership with the drummer Jeff Williams, is featured at length on “Bilbao Song”, showing himself to be one of a new breed of player (along with Thomas Morgan and Larry Grenadier) whose renunciation of the desire to play faster, higher and ever more intricate lines acts to the great benefit of the music. Julian Siegel’s tenor saxophone and Mark Nightingale’s trombone are featured to good effect on “Las Vegas Tango”. Robbie Robson adds a light-fingered trumpet solo to “Sister Sadie” and plays the Miles role more than efficiently on “Spring is Here”. The altoist Finn Peters evokes the very different spirits of Coleman on “Ramblin'” and Cannonball Adderley on “St Louis Blues” without being remotely imitative. And the gifted pianist Hans Koller brings his own approach to Evans’ sidelong, minimalist keyboard style. I’ve gone on at length about these records because, as hard as it been to accept for the past quarter-century, we won’t be getting any more new music from Gil Evans. There wasn’t even nearly enough of it in his lifetime, thanks to the difficulty he always experienced in trying to write quickly or to order. Maybe one way of measuring his stature is to look at what he has inspired in others, and there can’t be much higher praise than to suggest that these two albums belong next to his own. 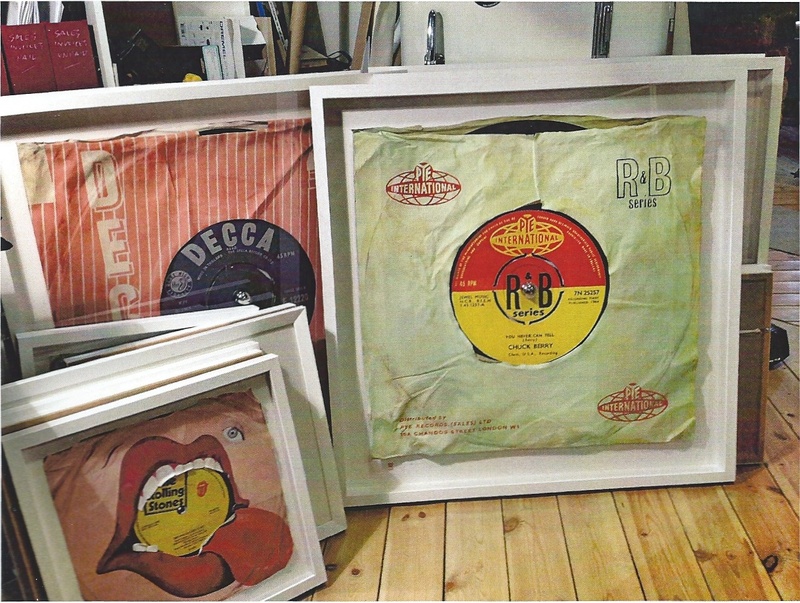 Morgan Howell recreates 45s as pieces of art because he wants to make them larger than life. As big, in fact, as the space they take up in your heart and mind. That means making 27-inch discs rather than seven-inch, encasing the enlarged vinyl facsimile in a reproduction of the original paper bag made out of canvas and painting the original graphics and type from the label and the bag, and then mounting the result in a 32×32 frame. But Howell is not trying simply to reproduce the record as it came out of the freshly delivered box of 25 on the record shop counter one Friday morning two or three generations ago. He wants to show the whole history of the individual record: the signs that it has been played and played and played again, treasured and cherished and carried from bedsit to party and onwards through life. So, with infinite care, he reproduces all the creases and tears, all the fading, all the smudges and lipstick smears, and even the traces of a long-since removed sticky label. Thirty of these three-dimensional objects — several full-scale originals, and some smaller prints — are on show all this month at the Snap Gallery, situated in an arcade between Piccadilly and Jermyn Street in London W1. Among them is Chuck Berry’s “You Never Can Tell”, issued on the gorgeous yellow and red Pye International R&B label in 1964, about which David Hepworth wrote quite beautifully in his blog a few weeks ago (click on http://www.davidhepworth.com/blog.html and scroll down to June 19, 2013). You’ll also find “Shakin’ All Over” (with that marvellous expressionist 1960 EMI bag), “Green Onions” on Stax, “Good Luck Charm” on UK RCA, “My Generation”, the Chiffons’ “Sweet Talkin’ Guy” on Laurie, the original US Columbia issue of “Like a Rolling Stone” and many others. When Morgan Howell told me that the first one on which he’d tried the technique was Martha and the Vandellas’ “Heat Wave”, borrowed from his big sister’s record collection, I knew he was a man after my own heart. I told him that I could remember precisely where and when I heard that record for the first time, standing beside my parents’ KB valve radio one evening in September 1963: my first blast of the full-strength, fully developed Motown sound. His own favourite is one of which he’s done both the A and B sides: “Get Back” and “Don’t Let Me Down” by the Beatles, which has a special meaning for him since he happened to be sitting in the back of his father’s Ford Zodiac, aged three, when they got stuck on Savile Row in an unexpected traffic jam on January 30, 1969, the day the Beatles played together in public for the last time on the Apple roof. They’re not cheap: the originals cost £9,600, prints at the same size are £2,000, and the scaled-down versions are £595. In any size they’d be a very nice thing to have on your wall, even if you preferred “Paranoid” or “Hotel California” to “You Never Can Tell”. And, inevitably, you start playing the game of what you’d commission him to paint, if you could afford it. At the moment — and this is a purely imaginary exercise, you understand — I’m thinking Billy Preston’s “Billy’s Bag”, on the UK Sue label, with that fantastic paper bag listing all the label’s artists. Or maybe the Reflections’ “(Just Like) Romeo and Juliet” on Stateside. No, it’s got to be Kenny Dino’s “Your Ma Said You Cried in Your Sleep Last Night”, with my then-girlfriend’s name inscribed in nail polish on its HMV/United Artists label 51 years ago. Now there’s a record that deserves to have its portrait painted. The last time I saw this car, in May 1971, it was parked outside Morgan Studios in Willesden, North London. Its owner was inside the building, finishing off Every Picture Tells a Story. That February I’d been on the road with Rod Stewart and the Faces in Boston and Jersey City, writing a story for the Melody Maker. You can imagine it was pretty good fun, as long weekends go. Now here I was, three months later, listening to Rod waxing lyrical about David Ruffin as he put the final touches to his cover of the Temptations’ “(I Know) I’m Losing You”. Then came the wonderful experience of having “Mandolin Wind” and “Maggie May” played back through the studio speakers. Martin Quittenton was in the studio that night, having made a vital contribution to the album as guitarist, mandolinist and co-writer. “Mandolin Wind” remains my favourite of Rod’s recordings, by a distance. The car over which he lost sleep is now to be auctioned by Bonhams at the Goodwood Revival in September. 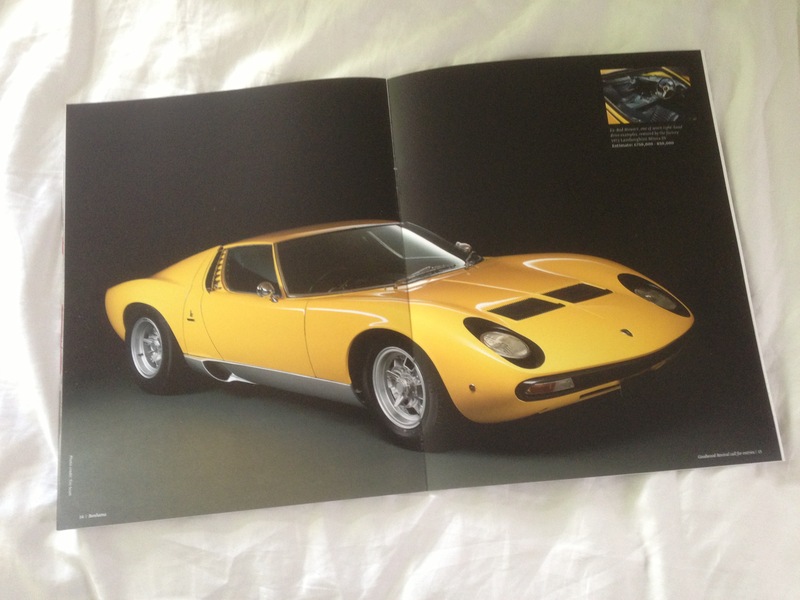 The picture above is of the sale brochure, and the estimate for the car is between £750,000 and £850,000. A lot of money, but almost certainly a great deal less than the value of whichever of his houses its first owner will be sleeping in tonight. I’ll save my story about seeing Rod for the first time in 1964, with one of my favourite bands ever, for another day.